Oh no. No, no, no, you’re thinking. Not another Barts MS Blog lecture on the importance of exercising when you have multiple sclerosis. Especially a guest blog from that Dave guy who runs ActiveMSers.org and who thinks he is funny and has no professional medical or physical fitness credentials—just a dude who runs a blog, ruffles feathers like Gavin, and works out. I get it. I mean, I could point you to a collection of scientific abstracts covering virtually every competent exercise study done on MS over the past decade—I’ve painstakingly gathered almost 150—with nearly all pointing to the same conclusion: it’s a seriously big deal. Yawn, you already know. I also could direct you to the largest collection of exercise tips and tricks for MSers on the internet—vetted by physical therapists and MS experts—including the five ultimate MS exercise hacks so that you can get started ASAP on how to maximize your life with MS. But that would be folly. And I could steer you to motivational stories of fellow athletic MSers, gear advice that makes exercise easier, and a host of articles about everything from cycling with this disease to the critical importance of stretching. But no, let’s not go there. On the surface, potato chips seem to make the most sense, as it is more commonly used worldwide. But then again, “crisp” seems to better convey the sound made when you bite into one. And it doesn’t muddy the waters with a dozen other uses like “chip” does. Cow chip. Chip off the old block. Poker chip. Chip shot. Chocolate chip. Chip on your shoulder. Computer chip. Confusing as all get out, right? Thankfully there isn’t such a thing as a cow crisp. Plus, the English aren’t going to serve fish and french fries, that’s just wrong on so many levels. Now if you are thinking this is a deviously clever way of connecting exercise with potato chips/crisps using classic psychological conditioning techniques to reframe neural pathways in order to establish learned associations so that every time you consume a bag of chips/crisps you ponder exercising, you would be wrong. I got a B in Psychology 101; I have absolutely no clue what I am talking about. But as author of arguably the longest-running MS blog and with gobs of first-hand experience with just about every aspect of this disease (and, sigh, treatment, including even HSCT), I do know a thing or two about multiple sclerosis. And exercise. I crank it, hard, daily, even though these days I mostly roll in a wheelchair. Well pardon me, gotta run, I’ve got a case of the munchies. Oh damn, that reminds me it’s also time to work out. (With a shaking first in the air, I curse me and learned association!!!) Oh, I’ll still enjoy those crisps/chips and so will you. Besides, the salt sure tastes yummy after working up a good sweat. Be active, stay fit, and keep exploring! 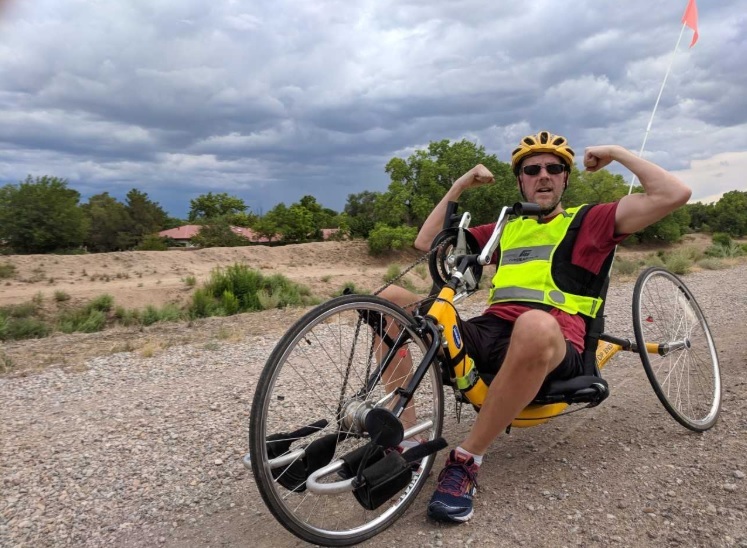 Dave Bexfield is the founder of ActiveMSers, a website designed to help, motivate and inspire those with multiple sclerosis to stay as active as possible—physically, intellectually and socially—regardless of physical limitations. Established when Dave was diagnosed in 2006, ActiveMSers has helped hundreds of thousands of people with MS from around the world through its encouraging website, blog, Twitter feed, Facebook page, Instagram pics, YouTube videos, and discussion forum. An Albuquerque, NM, resident and longtime professional writer, Dave’s efforts have been championed by The New York Times and many other publications have spotlighted his journey and stubborn defiance with MS. He is active in the larger MS community, volunteering for iConquerMS as well as the National MS Society (USA). Armed with attitude, a wheelchair, and a pair of forearm crutches, Dave continues to travel the world with his wife of 25 years, Laura. Dave, why have we not come across each other before? I am on the same track, although I do not have the pleasure any more of living with my wife Ros like you and Laura. I live now in a high needs aged care facility courtesy of "Mr MS"
If I wrote a Guest Post, which I have been invited to, it would be this one because my exercise regime a justification for it it is just as you describe. Why have I not yet written that post? For reasons that would probably interest you. The main one is the folding travel Bed Pole which weighs under 2 kilograms and folds into a neat package that will fit into your suitcase and confused the hell out of the people looking at the package scanners in the airports. I want the guest post to coincide with the product coming to market although my engineer friend,Rodney, i s looking for people who lead a life like yours to receive early production run products to evaluate them. Thanks David. Our paths have now officially crossed! Thanks Luis. My Portuguese is a bit rusty, but valeu kind sir. Ditto, JoH. Glad you highlighted that. While it may be heavy reading and take time to digest, my 10-year collection of the 150 scientific research studies about exercise and MS is eye opening. Most people would skim right past that, not click the link, and focus on the chip/crisp debate. Even with laziness or fatigue, I try to exercise. It's like I get better right after exercise. Sometimes I wonder if it would not be psychosomatic, but I just know that I still feel very good after exercising. I, unfortunately after a work out I feel drained for a good two days later. This post-exercise malaise keeps me from working out regularly, so at least I try to walk a lot.